I enjoy seeing the cakes that you feature in CA, and wondered if you’d like to see my latest creation, made to mark my parents’ 50th wedding anniversary? It is an entirely edible version of the Priory Church of St Peter’s in Dunstable, where Cranmer sat in judgement of the proposed divorce of Henry VIII and Catherine of Aragon. My husband Alan lent invaluable help by cutting little stamps from erasers in order to mark out the windows. 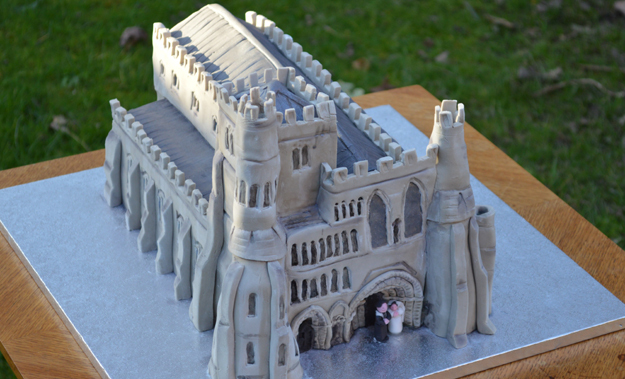 My cake shows the Priory in its post-Reformation condition, as I felt the entire structure to be beyond my powers! This edition of edible archaeology appeared in issue 293 of Current Archaeology.